Hundreds of people lined up outside Apple’s store in central Sydney early on Friday to be the first in the world to get their hands on the new iPhone X, a turnaround from more lackluster launches for the past two iterations of the phone. The Sydney store opened its doors shortly after Apple released its fourth quarter results that showed forecast revenue for the holiday shopping-quarter largely above market expectations. Shares in the company rose three per cent in after-hours to a new all-time high as investor concerns about production delays for the new phone were allayed. Around 400 people lined up outside Apple's flagship Sydney branch to pay $1,579 (US$1,218) for the 10th-anniversary model, and chief executive Tim Cook has billed the glass and stainless steel device "the biggest leap forward since the original iPhone." 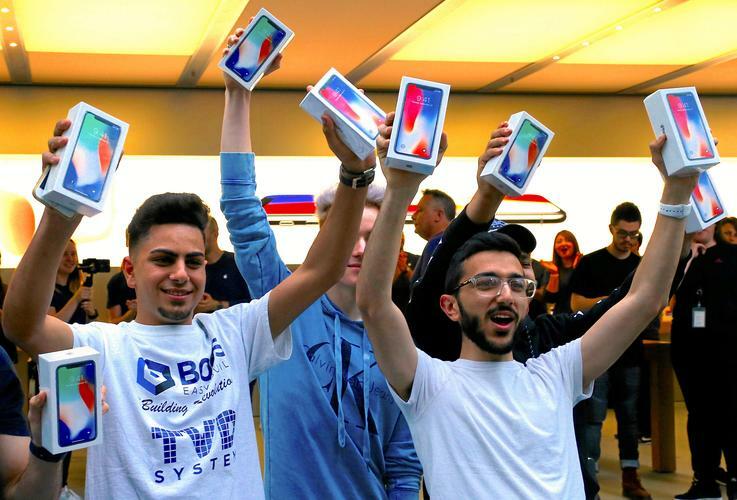 "It's beautiful bro, what a feeling, I'm excited," builder Bishoy Behman, 18, told Reuters after picking up two phones as the first person in the queue. Behman said he camped outside the store for a week and said he plans to sell the phones on for around $3,000 each. "I'm here for the profit, of course, it's business," he said. Apple opened pre-orders for the iPhone X on 27 October and has said demand has been "off the charts," although some analysts have been worried about supply chain issues that might prevent the company from making enough phones to satisfy demand. Apple CFO, Luca Maestri, said the company was "quite happy" with how manufacturing of the iPhone X was progressing, noting that "production is growing every week, and that's very, very important during a ramp period." Apple forecast fiscal first-quarter revenue of US$84-87 billion. Analysts on average were expecting US$84.18 billion, according to Thomson Reuters I/B/E/S. The company's net income rose to US$10.71 billion in the fourth quarter from US$9.01 billion a year earlier. The iPhone X comes a decade after the original iPhone, the product that powered Apple's rise to become the world's biggest technology company with a market capitalization of US$862 billion. Apple for years has sought to make the release of its new phones a landmark event. But this year it took the unusual step of a staggered launch, releasing the iPhone 8 - essentially an incremental advance over the iPhone 7 - several weeks earlier than the iPhone X.